PJ Grads: Have You Plunged In? Several weeks ago I sat down over lunch with a wonderful lady who was attending my three day Business of Photography workshop at UCLA Extension. A graduate of a state university with a degree in journalism and an emphasis in photojournalism, we began to chat about her work, and I’ve been thinking about that conversation ever since. 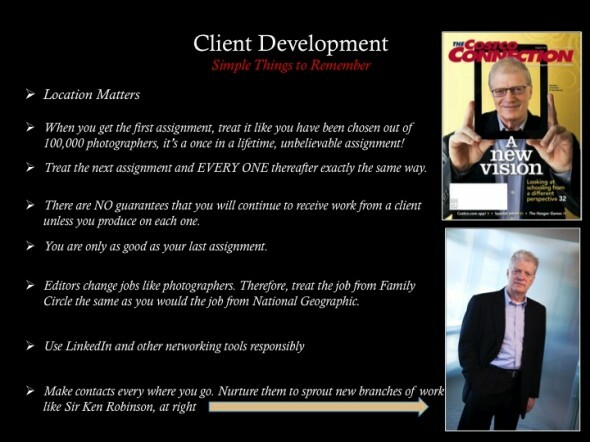 It seems to me there is a problem plaguing photojournalism grads. In short, graduates have little or no clue at all about how to launch their career. Harsh? Yes. Truthful? As I see it. But it’s not the grads’ fault. The one I talked with received virtually no training whatsoever about portfolio development, client development, contract negotiations, copyright, rate structures or any other business issues, so how can she (or any other grad) reasonably expect to enter into the world of freelance without being either overwhelmed, exploited or both? The problem as I see it is simple. The majority of universities with photojournalism programs are stuck in the mud. Deep, thick, shoe snatching, Alabama mud. Sure, they are all teaching eager, bright-eyed students how to shoot, gather audio, record video and put together multimedia pieces. But is that enough? No, not by a long shot in this evolutionary time. Twenty years ago it was, but twenty years ago photojournalism grads were able to take their skills and go to work as staff employees of newspapers. Hell, some of you might even remember that we could choose to work for weeklies, dailies, afternoon dailies and evening dailies. No grads needed to know about Work for Hire agreements or how to get your book in front of the national editor of TIME? Times have changed in twenty years, but apparently the universities didn’t get the message. Among the thirty students of all talent and experience in my recent workshop, nearly every one of them, as god is my witness, commented at one point or another that they had never been taught about licensing images or rate structure for different clients. How can that be? How can universities take tens of thousands of dollars to create a photojournalist who can light a portrait but not have any idea how to get a client or quote an assignment? Is that not borderline fraud? Another young man who took the workshop emailed me halfway through to ask my opinion on a job offer he was presented. He wanted to know if accepting a $150 gift card from a major fashion corporation to shoot a three hour event was fair? Granted, he suspected he was being undervalued, but wanted to know if I thought he should accept the job. I wouldn’t tell him yes or no, but I did tell him that a shoot like that (based on the normal all use requirements a company requests for these things) would result in a quote of a couple thousand dollars at least, he decided to pass on the job offer. Do I blame the student for even considering the job? No, not at all, but I cringe when I hear these stories. The publishing world has been in turmoil for years and photojournalists have been a part of that turmoil. Universities are being paid big money to educate and train photojournalists, yet their only means of adapting to a changed market has been to embrace multimedia. Okay, that’s great, but that’s only a fraction of the change that has swept through the publishing world. Are journalism chairpersons unaware of employment trends? Do they not know that staffs are shrinking and being eliminated all together? Why aren’t the professors teaching courses on copyright, licensing, how to build your client base or set-up legal business structures (sole proprietor, LLC or S Corp)? Or, at the very least, why aren’t the universities mandating a core set of business classes at a time when the vast majority will enter the photojournalism profession as freelancers? Granted, bureaucracies like universities are always slow to adapt, but enough time has passed. The time is NOW to act. The time is NOW for journalism departments to track down the last five years of graduates and ask how they’re doing, where they’re working and if they were prepared well. Universities love to cite statistics, so let’s see some stats indicating how the school’s grads have fared in the freelance world. It’s inherently unfair for new grads to be cast out into the “real world” to be preyed upon by corporations and publishing empires who dangle the proverbial “exposure” carrot in front of them while demanding a copyright transfer via a Work for Hire contract. Yes, grads need exposure, but they also need to earn a living. How else are they going to pay off their student loans? Beautifully written and well said Todd. If only PJ schools taught, or even encouraged taking, business courses students would be much better off. I graduated from Western Kentucky with my BA in PJ and when the job market plummeted, I was left high and dry. Thank god I have the smarts to keep learning after graduating in 2000. But that still didn’t help. Now, I have my own business and I really wish I had some sense to take a few business classes while I was in college. Students today need to learn how to do everything themselves. From self promotion to bookkeeping. And yes, I think it is odd that even in a downward spiriling market, more and more are entering college to become PJs.